With the first half of the 2018-19 WCHA regular season set to pause following four games on Saturday, Dec. 15, several freshmen have a few games remaining to finish the fall semester strong after impressive starts to their college careers. Last season, Minnesota State forward Jake Jaremko earned the honor of WCHA Rookie of the Year, posting 39 total points (15 G, 24 A) in 40 games. He registered 35 points (14 G, 21 A) in 38 WCHA contests. Three WCHA freshmen are tied for the conference lead in points, including Jaremko’s teammate, forward Julian Napravnik. It’s not all about the offense, but the race is tight heading into Week 9 as two defensemen and another forward sit at the top with Napravnik. The German-born Napravnik has had consistent success in North America since joining the USHL’s Des Moines Buccaneers three years ago. Last season, Napravnik finished second in team scoring with the Buccaneers with 38 points (19 G, 19 A) in 60 games. The 21-year-old has brought consistent offense for the No. 3-ranked Mavericks with 11 points in 13 games. He’s posted an assist in eight of his past nine games but has been hard-pressed for goals after scoring three in his first four games. The forward sits fifth in team scoring for the 12-2 Mavericks and will look to keep his offense rolling when his team hosts a bottom-table Alaska Anchorage team this weekend. Zech was named the BCHL Defenseman of the Year in 2017-18 after scoring 69 points (11 G, 58 A) in 58 games, and it’s looking like he could follow it up as the 2019 WCHA Rookie of the Year. The freshmen’s two multi-point games over the weekend were his second and third such outings in his past five games. It was only a matter of time before Zech had an offensive breakthrough given the chemistry he’s built with defensive partner Nate Kallen. Zech and the Bulldogs (4-10) have a tough matchup ahead of them this weekend when they take on No. 12 Bowling Green. It’s the Bulldogs’ first home games in a month and they’ll be on the road for their next three series afterward. This time last year, Nordqvist announced his commitment to Lake Superior State while playing for the USHL’s Fargo Force, at the time in his first season in North America. He had previously spent his entire career in his home country of Sweden. Nordqvist has had an immediate impact for the 7-6-1 Lakers as they sit just three wins shy of last year’s 10-22-4 record. He is fourth in team scoring, behind three seniors, as his youth shows the promise in Sault Ste. Marie. The Lakers wrap up their fall regular season schedule with a trip to Alaska this weekend, who they went 0-1-1 against in early November. Nordqvist posted a goal and an assist in their first series. Last season, Halonen finished third in team scoring as a rookie with the aforementioned Buccaneers with 35 points (16 G, 19 A) in 59 games, just three points behind Napravnik. The 19-year-old’s offense has come and gone this season for the 8-5-1 Huskies, but he’s currently riding a four-game point streak (2 G, 2 A) and is second to only Jake Lucchini in team scoring, who sits fifth in WCHA scoring. The No. 20-ranked Huskies face Northern Michigan for a home-and-home series this weekend, and Halonen’s ability to chip in more offense through multi-point efforts will go a long way in Tech’s quest for the NCAA tournament this spring. With the winter break near, a strong second half will be crucial for these freshmen to continue to help carrying their team and keep their names in the mix as the 2019 WCHA Rookie of the Year. Don’t miss your chance to catch these rookies in action when you can stream the WCHA right here on FloHockey. Standing on the brink of history, the UMass hockey miracle finally ran aground. In a signature performance, Minnesota Duluth suffocated the Minutemen for 60 minutes, outplaying them in every facet of the game, crushing their championship dreams 3-0. This was the game that NCAA hockey desperately needed. Defending NCAA champ Minnesota Duluth will look to hold off a historic UMass Minutemen team as the Bulldogs return to the championship game for a third straight season. BUFFALO, N.Y. — Dynasties are often fleeting in college hockey. 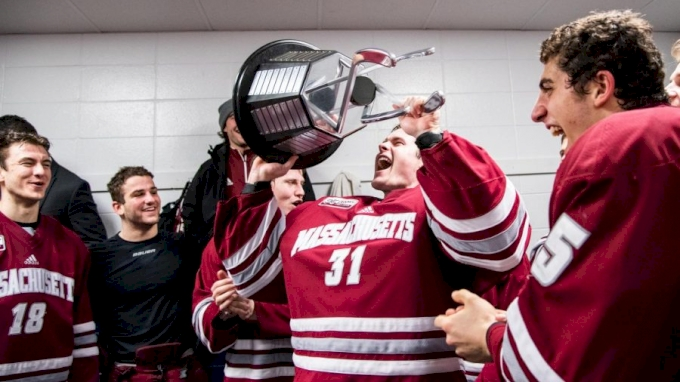 UMass goalie Filip Lindberg stands on the precipice of history, but you’d never know it. He’s been holding court with national media for two weeks now. He’s still in his first season away from his native Finland, yet he fields questions from all angles like an upperclassman. Ben Barr, the coach who recruited this Nordic manchild, never doubted his mettle.